The mental process by which hypotheses are suggested is obscure. Ordinarily they flash into consciousness without premonition, and it would he easy to ascribe them to a mysterious intuition or creative faculty; but this would contravene one of the broadest generalizations of modern psychology. 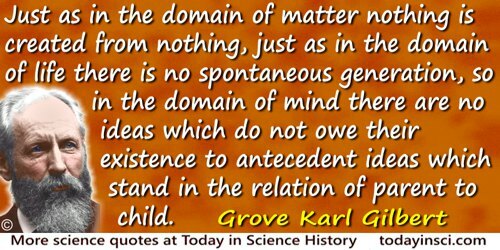 Just as in the domain of matter nothing is created from nothing, just as in the domain of life there is no spontaneous generation, so in the domain of mind there are no ideas which do not owe their existence to antecedent ideas which stand in the relation of parent to child. In Address (11 Dec 1895) as President of the Geological Society, 'The Origin of Hypotheses, illustrated by the Discussion of a Topographical Problem', printed as Presidential Address of Grove Karl Gilbert (1896), 4. Also collected in Science (1896), 3, 2.